Should You Choose All-Season or Summer Tires? Now is the time to take your winter tires off of your car and replace them with something else. However, what should you replace them with? Summer tires are a great option, but all-season tires can also be appropriate. In this blog, we’ll be reviewing the strengths and weaknesses of each type of tire so you can make an informed decision. All-season tires are designed to offer you a great balance of features for the entire year. On top of providing good performance in dry and wet conditions, these tires can also give you traction during snowy weather. All-season tires are typically manufactured with moderate tread depth and rubber that is made to offer greater tread life than summer tires. You can purchase all-season tires for a number of vehicles, load capacities and speed ratings easily. All-season tires will perform well in hot weather, but they often provide less traction than summer tires, so you might notice a difference when cornering, steering or braking. Just like they aren’t perfect for summer driving, they also aren’t ideal for driving in severe weather conditions during the winter. If you live in a mild climate and don’t drive in extreme weather often, all-season tires are just fine. Summer tires are great for high-performance vehicles and are designed with agility and speed in mind. Due to unique tread patterns and rubber, they provide the driver with excellent precision on the road and place as much rubber on the road as possible. The treads are also made to stay as flexible as possible, which promotes a high level of traction and grip. They are also excellent for driving in both wet and dry conditions on any sport utility or high-performance vehicles. The tread patterns are well-suited to preventing hydroplaning and evacuating water from the tire surface. 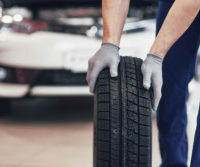 When you’re struggling to choose the right tire for the vehicle and manner in which you drive, you can always trust Mobile Auto Service to help. We have access to a broad range of tires designed to meet your manufacturer’s speed rating, size guidelines, load capacity and more. Mobile Auto Service is there for you anytime you need us. Whether you’re in the middle of a roadside emergency or looking for seasonal maintenance, you should always have our number handy. Use Mobile Auto Service to fulfill any variety of your auto repair and maintenance needs. To schedule your affordable and honest service today, contact us for a free quote at 443-424-0131. While cheap brake jobs might seem inexpensive up front, their cost over time can be insurmountable. From a dangerous accident caused by cheap aftermarket parts to permanent damage to your car as a result of bad brakes, here’s what every driver needs to know about the dangers of cheap brake jobs. If you pay for cheap brake jobs, you are paying for lower-quality or less labor and lower-quality products. Of course, there are inexpensive brake pads on the market, but they have a radically lower lifespan, a poorer safety rating and lower driver satisfaction. 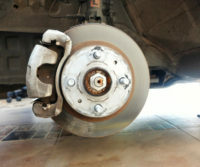 In general, it can take almost 0.9 hours just to replace brake pads, and an additional 0.2-0.4 hours to replace rotors. If a brake job is suspiciously inexpensive, it might also mean the person completing it is inexperienced, rushing or both. This comparison might seem odd, but think of purchasing brakes like purchasing medicine for a cold. When you are buying a drug, you are not just paying for the cost of making, packaging and advertising the medicine. Instead, you are also paying for all of the research and development that went into the cold medicine. The same exact thing is true for brake pads. The most reputable manufacturers spend a great deal of time and money developing effective brake pads for different vehicles. From simulation testing to on-vehicle testing in a controlled environment, hundreds of hours go into the development of a single type of quality brake pad. Brake Rotors: Brake rotors are the first thing to be damaged once your brake pads wear down. The rotors can get warped, cracked or ground down over time and need to be replaced. Calipers: Calipers are critical parts of your brake system. Once the pads wear down, there is no barrier between the calipers and rotors, so the two parts will grind against each other and cause severe damage to both parts. Suspension: The suspension system helps your ride to feel smooth even when you are driving on a bumpy road. Cheap brake jobs can throw off the suspension system and make your car out of alignment, which can do damage to the entire vehicle. 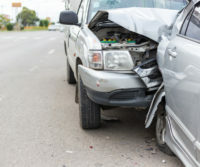 While every type of accident can cause a certain amount of damage, rear-end collisions are particularly dangerous. Because these accidents are often minor and untreated by drivers, the damage done below the surface can go undiscovered until it is too late. What do you need to know about the hidden problems caused by rear-end collisions? The bumpers on your car are made of plastic. Whenever your bumper is cracked or dented, the impact of the collision might have reached the frame of your car. Even small accidents can bend a frame slightly, and slight frame damage can mean serious and costly repairs. Unaddressed frame problems can lead to warning system sensor issues, less frame strength and more damage if another collision happens in the future. When you drive a car with a stick shift or a manual transmission, there are several bad habits that can do real damage to your car. Your transmission might not be something you think about very often, but replacing it is costly and labor-intensive. Here are the bad stick shift driving habits every manual transmission car driver needs to avoid. Resting Your Hand on the Shifter: Whenever you shift gears in your car, the selector fork is pushed against a rotating collar. The collar engages with whichever gear you chose. When you use your shifter as a hand rest, the extra weight can force the fork to remain in contact with the collar for an extended period of time, which causes unnecessary wear to both parts. Keep your hands on the wheel and avoid constantly touching the shifter. Riding the Clutch: Whenever you press down on the clutch, it will disengage to let you shift gears. When you let your foot off, it will re-engage the clutch. If you leave your foot on the pedal after you switch gears, which is called riding the clutch, it will make the disc slip and will stop it from engaging fully. Force yourself to keep your feet away from the clutch pedal whenever you are not utilizing it. Leaving Your Car in Gear at Red Lights: Your car’s clutch is made to engage and disengage rapidly, but not to be constantly disengaged. If you keep your car in gear while at red lights and stopped, you are forcing the bearings to remain pressed against the springs and diaphragm, which does damage similar to when you ride the clutch. Slamming into Gears and then Popping the Clutch: Some drivers have the bad stick shift habit of slamming into each gear and then popping the clutch. This leads to premature wear on the shifter forks, clutch and synchronizers. Additionally, this is pretty uncomfortable for your passengers. It leads to a jerky ride that is anything but smooth. Instead, practice shifting smoothly from gear to gear—it will get you there just as quickly! You’re probably aware that flat tires or poorly inflated tires are a danger on the road, but did you realize that worn and old tires can be just as dangerous? While the risks might not present themselves immediately, old tires are a hazard to your vehicle, you and other motorists on the road. Think of tires like a rubber band. Old rubber bands that have been used for a long time, exposed to the elements or stretched too much will start to show cracks when you stretch them. In a similar fashion, the tires on your car face a number of harsh road conditions that lead to cracks you can’t necessarily see. Over time, the cracking on the inside of the tires will cause the steel treads to separate from the rubber parts of the tire. How Long Can You Drive Your Tires? Depending on what tires you buy and how you drive, your tire lifespan will change. Many automobile manufacturers suggest that you replace your tires every 6 years, but some tire manufacturers suggest replacement every 10 years. In general, the more that you drive your car and the harsher the road conditions are, the more frequently you will need to replace your tires. What factors affect the longevity of your tires? Heat: Tires age faster in warmer climates where cars have exposure to coastal climates and sunlight. Conditions: How do you treat your tires? Are they properly inflated? 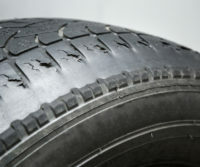 Underinflated tires will have more wear and tear. Driving habits will also negatively impact tires, and things like hitting the curb often or past repairs for a puncture will lead to a shorter lifespan. Why Are Old Tires Dangerous? Increased Hydroplaning Risk: As your tire tread wears away, the grooves will become shallower and less above to keep water away from the tire. Bald tires will hydroplane on roads that are only slightly wet. Heat Buildup: Driving makes friction between the road and tires, which also makes heat. Treads help tires to cool and prevent blowouts. Without tread, heat levels will rise. 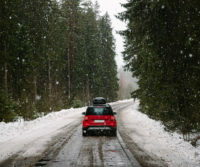 Poor Handling in Weather: Driving on a road that is covered in ice or snow is dangerous enough with good tires, and old tires can make for a disastrous situation. While it might be what’s responsible for keeping your car on the road every day, the engine is vastly underappreciated by many car owners. Your car’s engine is the heart of the vehicle, and it’s incredibly expensive to repair or replace. How can you take excellent care of your car’s engine and save yourself money and hassle in the long run? Your car’s engine is filled with countless intricate moving parts. As a result, all of those parts need to be properly lubricated for optimal function. As you drive and generate heat with your vehicle, the oil in your car will degrade and lose its ability to lubricate your engine. Carbon deposits, or sludge, will start forming inside, but if you have regular oil changes and take great care of your engine, you don’t need to worry about long-term damage. Not sure if you are due for an oil change? Mobile Auto Service can assess your car and quickly perform an oil change to keep things in tip-top shape. The worst engine problems are typically caused by overheating. Overheating on a single occasion can lead to serious engine repairs or require outright replacement. If the coolant level is too low as a result of a leak, the engine can overheat in the aftermath. Failed water pumps, faulty radiator fans and thermostats can all also lead to an overheated engine. 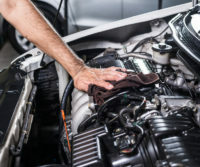 To take care of your car’s engine, you should always keep your coolant levels topped up and schedule service from Mobile Auto Service if your engine temperature is rising more than it typically does. The engine air filter stops debris and dust from entering your car’s engine. If your current filter is clogged up, your car’s engine will not be able to adequately pull in new air, which leads to a lack of power when you are accelerating or passing other vehicles. Outdated and weathered air filters can actually break completely and allow dust and debris directly into the engine. Air filters should be replaced every 15,000-25,000 miles, or more frequently if you drive in dusty areas or on unpaved roads. Are you headed on a road trip for the holidays or over the winter months? Before you pack your bags and load up the car, you should brush up on the best ways to stay safe on the road during long-distance road trips. Think about the pacing of your trip before you leave. The time to think about exhaustion isn’t when you’re struggling to stay awake, but before you’ve even left your driveway. A condition known as “highway hypnosis” is very common on long-distance road trips, particularly when driving on boring highways without much to look at. Even worse, over 60% of drivers indicate that they’ve driven while drowsy. Always take regular breaks on the road and trade off with a partner regularly. It’s better to stop for the night or take a nap instead of risking falling asleep at the wheel. Don’t just think about fuel for your car! You should also think about fuel for your body. Carry bottled water and snacks with you on the road and don’t rely on fast food places to always be present. Small, filling snacks like carrots and almonds are great ways to get a boost of energy without making yourself uncomfortably full. If you know the route you’ll be taking in advance, you should plan out stops at regular intervals along the way. Getting out of the car to keep your circulation going is important to staying awake and staying healthy on long-distance road trips. In general, you should plan to stop every 2 hours to stretch your legs, take a bathroom break and fill up your car if needed. Adjust your car seat before you leave on a long-distance road trip. Your seat should be tilted so that you have maximum circulation and are sitting up straight. If you feel tension in your body or notice part of your body feeling particularly sore, you should adjust the seat height and incline to make you more comfortable. Extreme road conditions are everywhere in the winter season, from snowy winter mornings to heavy holiday traffic clogging the highways. 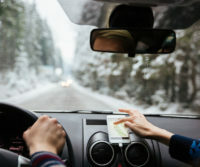 Preparing for extreme road conditions is essential to making it through the holidays safely, so now is the time to refresh your memory on what to do when you’re in a sticky situation. Slow down! Wet roads slow your car’s reaction time, so you should always follow the speed limit when driving in the rain. Turn on your headlights. Maryland requires all drivers using their windshield wipers to use their headlights when driving, so increase your visibility and the ability of other drivers to see your car by turning them on. Keep more space between your car and the car in front of you. Avoid heavy braking when it’s raining. Try to first slow your car by taking your foot off the gas earlier than you typically would. Accelerate and decelerate your car slowly to avoid skidding and keep as much traction as possible. Always allow more time to stop at traffic lights and stop signs. The recommended following distance of 3-4 seconds for driving on a dry road increases to 8-10 seconds in snowy conditions, so allow plenty of space between your car and others around you. Don’t try to power your way up hilly roads. Putting your pedal to the metal on snowy roads will get your wheels spinning and leave you stuck. High speeds on icy roads mean trouble stopping and a high chance your car will spin out of control. Never drive over 45 mph in any car when roads are icy. Black ice can surprise you in an instant. If possible, avoid driving on icy roads entirely. If you are fishtailing or sliding in your car, turn into the slide. Turn your car wheels in the direction that the back of your car is sliding. Be careful not to overcorrect. Remove distractions from your car as much as possible. Even if it’s boring to stare at headlights, playing on your phone is a good way to rear-end someone. Practice defensive driving, including looking out for cars with drivers who aren’t paying attention, signaling before turning or merging, putting space between you and other vehicles and always following the flow of traffic. Will you be hitting the road this winter? Now is the time to brush up on the best driving techniques for making it through the cold and snow. Never drive in the winter when you are feeling tired and fatigued, especially if there is precipitation coming down. Don’t warm up your car in an enclosed space, like a garage, and check the tailpipe to make sure it is clear from snow. Always keep your gas tank at least 50% full to prevent your fuel lines from freezing. If you’re headed on a long-distance trip, check weather reports on your drive. If there will be severe weather on the way, try to plan your route to avoid it, or plan on stopping at a hotel for the night on the way. Have your car inspected before you head on a road trip to make sure that everything is in good working order. Mobile Auto Service can visit you at home or at work to give your car a preventative maintenance check-up and make sure you’ll be safe on the road. If you do get stranded in the snow, you should stay inside your car. It will give you some shelter and make it easier for anyone stopping to help or Mobile Auto Service to find your car. You should also make sure that you keep an emergency kit in the trunk or back seat of your car in case this happens. It should contain blankets, gloves, hats, scarves, non-perishable food, water and any medication that you need. Always accelerate and decelerate slowly. 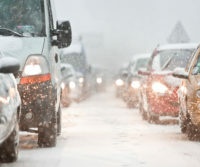 Never try to speed or rapidly move in the snow, because it takes much longer to slow down on icy and snow-filled roads. Know how your car’s brakes work. If you have antilock brakes, you should be braking differently than if you do not. Keep the heel of your foot on the floor when braking and apply steady, firm pressure. If your antilock brakes kick on, continue driving and do not pump the pedal. If you are heading up a hill, don’t try to power up it or your wheels will spin. Use inertia to carry your car to the top. Once you get to the top of a hill, slow your speed and go down the other side as slowly as you can. Mobile Auto Service is there for you anytime you need us. Whether you’re in the middle of a roadside emergency, dealing with a car that won’t start or looking for regular preventative maintenance, you should always have our number handy. Use Mobile Auto Service to fulfill any variety of your auto repair and maintenance needs. To schedule your affordable and honest service today, contact us for a free quote at 443-424-0131. Cold weather is here, which means that countless drivers are heading downstairs in the morning only to sit in a car that won’t start! If your car won’t start this winter, here is what you need to do to get yourself back on the road as quickly as possible. If you turn the key and the engine won’t crank at all, you might hear either total silence or a persistent clicking sound. These are signs that your battery might be dead. First, you should try to turn on the headlights of your car. If the lights are dim, your battery connections might be weak, or the battery might be totally dead. Try tightening and cleaning the battery connections and see if that does the trick. If not, give your car a jump and call Mobile Auto Service for a new battery. If the starter is turning, but your car won’t start, the issue could be any one of a number of things. A frozen fuel line is very common in the cold winter months. If you keep your fuel tank less than half full and water is in the fuel line, the water will freeze and stop your car from starting. 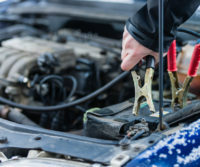 If you have been driving lately in wet weather or a lot of snow, wet engine components or spark plugs can also prevent your vehicle from starting. You shouldn’t try to fix these problems on your own. Instead, you should give a call to Mobile Auto Service. We can quickly diagnose the exact problem and make the necessary repairs to get you on the road again. If you hear a quiet click, cycling the key around might help to get your car started. Turn your car key from the off position to the start position about 10 times. Give your car a few minutes of a break, and then start the engine again. Try this cycling technique a couple of times in a row to see if your car starts. Call Us When Your Car Won’t Start!